T P McKenna The Sweeney. This is One Spare Part watching the telly for the Spotted thread. Bong! Mr TP will return in Callan towards the end of the series (next week), then Van de Valk!!!! As it is, I couldn't do any spotting as I was in a cold field watching Grandson's last football match. Well that deserves a Bong! The only B7 guest not to appear in this evenings The Sweeney was our fave Security Robot. The finale was the location that appeared in SLD...even Vila's gate got a a look in! 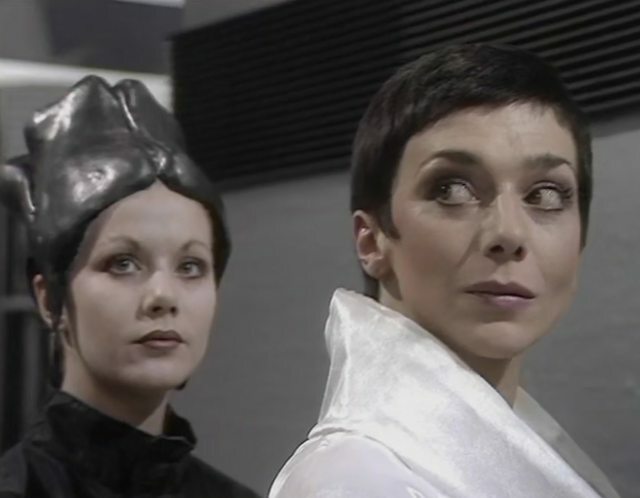 Pre-Soolin Glynis Barber as a mutoid in "Project Avalon". There's a new sitcom or comedy drama on BBC on Monday nights, 'Back To Life', about a woman being released from prison after eighteen years, and Souad Faress - Selma from Hortizon - appears in a couple of episodes as her next door neighbour. On my re-watch of Birds of a Feather, Travis II - Brian Croucher himself, appeared as a warder in the gaol which housed Daryl and Chris. David Jackson in a Ray Daley era episode of Minder, playing a man interested in racing greyhounds.